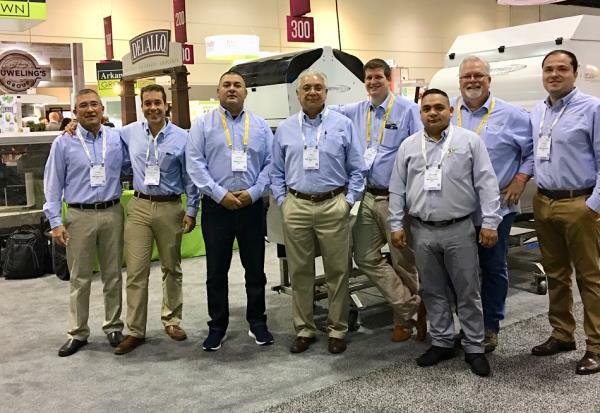 MAF INDUSTRIES LLC, part of the MAF RODA group, experts in sorting lines, have been exhibiting in the PMA Fresh Summit USA for more than 18 years. At this years PMA we visited MAFs exhibit and conversated with MAFs General Manager Art Navarro and MAF AGROBOTICA S.A DE C.V. Director Ing. Carlos Sepulveda. Navarro who has been involved with MAF RODA for 40 years, expressed how proud he is to be a part of this family owned business and appreciates the continuous growth and care for the employees. He is one of many employees that have been with MAF Roda for 15+ years. Today, the MAF USA Subsidiary counts 150+ employees, amongst which includes its own internal R&D department. MAF USA has recently gained a new VP of Operations, Pascal Deneuve, who has worked diligently to raise the level of efficiency, support, and commitment to our customers as well as our internal staff. In further discussion we learned of a MAFs record breaking time for an installation of a complete Turnkey solution. With the combined efforts from both MAF RODA USA and Mexico, MAF was capable of completing a multi-million dollar Avocado turnkey packing line installation in a record breaking 5 weeks. On the PMA Fresh summit, the sorting lines specialist had presented both a blueberry sorter and a cherry sorter with new technology using Global Scan 7, which includes hyper spectral cameras. The technology analyses 150 images per fruit. The number of images is adapted to the shape of the fruit and the customers special specifications. Also presented to its customers, a technology named the Insight which is being run to measure internal characteristics, both brix and dry matter. This technology is often used for apples, avocados, onion, citrus, and stone fruit.